The work in question is reportedly derived from a collaboration with Tyler Carter, who like Pierce houses his music at the great community site soundcloud.com. Pierce is at soundcloud.com/colepierce, Carter at soundcloud.com/tyler-carter, and the two of them apparently can make beautiful jittery ambience (or skittery soundscapes) together. Original track at soundcloud.com/colepierce. More on Pierce at colepierce.com. He was previously featured on this site in mid-October of last year (disquiet.com). Nine minutes of controlled chaos. That’s Fognozzle‘s “End Game,” a live, nearly nine-minute recording from late last year posted this past week at his bandcamp.fognozzle.net account. If a sound can be harrowing and comforting at the same time, this is it. It’s the sonic aura of urban tension (sirens, wailing voices, radio interference) transformed into a slow symphony of dessication. The piece moves from found noises set on short-turnaround repeat, to a raucous feedback solo, before a dénouement of introspective white noise — from routinized to improvised to an ever so patient fade. That transformation is key to Fognozzle’s accomplishment. The divide between the early looped work and the later-on freeform squall isn’t sharply determined. There’s a slow transition, and it’s only in retrospect that you might note that certain riffs have been done away with. Recorded live during the Godwaffle Noise Pancakes event at the Golden TrapperKeeper Lodge on September 26, 2009. More on Fognozzle (born Pete von Petrin) at fognozzle.net and pete.vonpetrin.com. More performances from the series at woundedsquid.blogspot.com. While Disquiet.com is not a gearhound guide, objects developed for music-making, especially those that can be described as gadgets, are not by any means off the site’s beat, especially when they can be seen as democratizing the production of sound. This forthcoming pocket-size analog synth from Korg, dubbed the Monotron, will have a relatively limited audience, even with its almost philanthropic $85 MSRP, but its size speaks to something larger. It’s no surprise that Korg is making this thing. Analog synths have been seeing a renewed interest, as a generation of musicians raised in a digital bubble have sought out first-hand experience with what preceded software-based composition and performance. And Korg has shown a unique aptitude for small-sized tools, from its “Nano” line of controllers, to its hand-held Kaoss Pad and Kaossilator — and let’s not forget its licensing of the Korg DS-10, a fully functioning simulation of an analog synth designed for the Nintendo DS gaming platform. And yet while the Monotron will sit nicely alongside, and interact well with, all of those devices, what it really seems like is a test — if the Monotron does well, perhaps we’ll see even more (and larger) analog synths returning to the market. (This isn’t to suggest that no analog tools are currently being manufactured.) For all the attention that will be paid to software-based synthesis in the coming weeks and months, once the Apple iPad is released, the Monotron hints that a whole other storyline may be brewing. Found via createdigitalmusic.com. Video at youtube.com. Details at korg.com/monotron. Prochnik is, by all appearances, a curious and creative reporter — he accompanies a patrolman in Washington, D.C., who responds to noise complaints, and visits various religious sites, including a Quaker meeting in Brooklyn and a monastery in Dubuque, Iowa. He tells a funny anecdote about seeking out an accomplished astronaut, only to learn that the experience of the silence of deep space mostly involves being inundated by instructions from mission control. My primary critique of the book at this juncture is that the title seems misleading — the book is, at least at the halfway point, less about pursuing silence than about escaping noise. This isn’t merely a matter of how the book has been packaged. 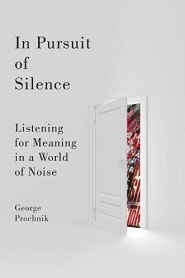 Prochnik’s sensitivity to sound as an irritant (“I’m scared of becoming a noise crank,” he writes on its first page) leads to situations in which zealousness may have yielded mistaken, or at least less-than-nuanced, interpretations. For example, the omnipresent iPod is seen here as a symbol of society’s embrace of 24/7 sonic immersion. However, I believe it can just as easily be read as evidence of a pursuit along the lines of the one that Prochnik himself has embarked on: an entirely personal attempt to block out the noise that the world imposes on us. His book-related blog, inpursuitofsilence.com, features tidbits about the energy produced by noise and the apparent genetic predilection among humans for beats. If the stats in Google Reader are to be believed, I am as of this evening the sole RSS subscriber (via Google Reader) to his blog, and I highly recommend signing up. Note: I usually post my “Quote of the Week” on Disquiet.com on Saturdays, but I took yesterday as a computer-free day and, entirely coincidental with the activist tone of Prochnik’s book (I didn’t start reading it until after lunch), a recorded-music-free day, as well (except at the gym, where I played Fescal’s forthcoming album, Lethal Industry, for at least the 20th time, a familiarity that to my mind qualifies it as background listening). It was a TV-free day, too, until about 10pm, when I succumbed to the wiles of a documentary about Sun Studio.